What do you have to pay attention to when you want to automate your law practice? We’re presenting you a two-part article with a check list. In the first part, we focus on the necessary modules and offer some thoughts on technology. In a second part, we will focus on optional modules and additional functionality. Lawyers don’t just deal with customers. They deal with a wide range of people and legal entities, in different capacities and roles. This is why many regular CRM programs won’t be sufficient. A decent contact management module is the cornerstone of any well-functioning law firm. As a lawyer, you work on cases. You need to meticulously keep track of everything that’s going on in the cases and the matters you’re handling. Typically, your case management is the central hub of your software that ties in with all other modules. There are two aspects to document management. On the one hand, as a lawyer you are likely to be confronted with thousands of documents, which may or may not pertain to one or more cases. You need a system to store, allocate and retrieve documents efficiently. On the other hand, as a lawyer, you constantly produce documents as well. That is the second aspect of Document Management: you need a module or app for document assembly (sometimes called an ‘act generator’). It uses templates that are filled out with the relevant data relating to the case. You also need to keep track of everything you have done, and everything you still have to do. Time Management in its widest sense covers several aspects, and often consists of several modules or apps. In order to increase efficiency, most programs work with predefined lists of frequently recurring tasks. Typically, there will be an app for fee management linked to that, that allows you to define default fees for specific tasks. You also will want the program to keep track of all the tasks you have already performed. As many lawyers work with a system of billable hours, a module for time tracking may come in handy, too. You not only want to keep track of what you’ve done already, you also need to keep track of what you still have to do. As a lawyer, specific tasks often have to be performed at specific times, which is why you need an agenda and/or calendaring app. Once you keep track of all the tasks you have performed, billing and invoicing becomes a piece of cake. Typically, the billing / invoicing module will not only allow you to create invoices. It also will allow you to generate statements, work with commissions, create intermediary overviews, etc. Ideally, your legal case management software should also have an accounting module that keeps track of all the payments you make and receive. Alternatively, your firm may want to use existing accounting software. If an accounting module is not included, then you should make sure there is a seamless integration between your legal case management software and the existing accounting software. And if you are dealing with third party payments, where you collect money on behalf of your clients, make sure the accounting module is designed to process those payments, as well. As our articles on the new legal consumers indicated, these days a client portal is a must, too. A client portal is a place on the Internet where your customers can view, and possibly edit, their own data. Usually it’s a web site that is accessible with a browser, but it could just as well be a mobile app. In the context of law firms, client portals offer clients to ability to get an overview of their case or cases: what has been done, what still needs to be done, what has been billed, what has been paid, what third party payments have been received, etc. Often, a client portal will also offer the built-in ability to directly communicate with the client, allowing the client to ask questions. These days, the majority of people are online on mobile devices. The software you choose should be able to offer web access, either through apps for mobile devices, and/or through mobile friendly web pages. Most leading software packages for legal case management are using cloud technology, be it private, hybrid or public cloud technologies, allowing you and your clients to access information from anywhere, at any time. Make sure you’re not choosing software that can’t be accessed over the Internet. Generally speaking, lawyers tend to be slow to adopt new technologies. Social media are no exception: many lawyers still, and incorrectly, assume there are no real benefits to using social media. In previous articles, we discovered that the new legal consumer behaves differently, and operates in an online paradigm. A three-pronged approach was suggested to attract the new legal consumers. The keywords were: cultivate / offer / engage. Many websites focus mainly on the offer aspect. Social media play an important role in the both the cultivate and engage aspects. In order to elaborate on this, it is good to pay some attention first to social media marketing in general. You probably already have a website, but somehow the percentage of visitors to your website that results in actual new customers is rather low. That is because the old ways of turning visitors into customers are not the most effective in an online paradigm. In the new online marketplace, everybody offering products or services must realise that they also are publishers, and that potential customers are content consumers. The way to turn website visitors into customers is to turn them into regular content consumers first. In her book, The Zen of Social Media Marketing: An Easier Way to Build Credibility, Generate Buzz, and Increase Revenue Shama Kabani explains the ACT Methodology for social media marketing: ACT is short for Attract – Convert – Transform. A stands for Attract. You want to draw attention or stand out. Practically, this means attracting traffic to your website, as well as to your presence on social media. Needless to say, you need to be active on social media, if you want to use them as a channel to attract visitors. C is for Convert. 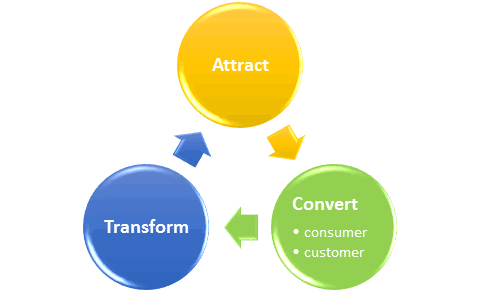 Conversion happens when you turn a stranger into a consumer or a customer. As mentioned above, there is a difference between the two. By converting a website or social media visitor into a content consumer, you create a relationship with him or her. Over time, this relationship increases the likelihood of that content consumer becoming a customer, provided you present them with quality content. The more is at stake, the longer this may take. This means that you constantly have to work to convert people into consumers and customers. Social Media are a great tool for turning strangers into content consumers. T stands for Transform. Transformation is when you turn past and present successes into magnetic forces of attraction. In a previous article, we found out that many people looking for a lawyer consider online reviews and testimonials important. Indeed, testimonials and reviews by existing customers help attract and subsequently convert new consumers and costumers. Social Media provide an extra, and important, platform for your existing customers to provide you with the glowing feedback which will help to do so. As a content provider, you must think of everything you publish online in function of one of the three aspects of the ACT methodology: how does what I put out there help attract, convert or transform? The same applies to the three-pronged approach of cultivating, adapting your offer and engaging with the new legal consumers: each has to be done with the purpose of attracting, converting or transforming. Social media are very well suited to cultivate the new legal consumers and engage with them. Media like LinkedIn, Facebook, Google+, or Reddit, e.g., are ideal platforms to offer assistance, or to start or take part in discussions. If you want to demonstrate your expertise, a blog on your website is not the only possible way to publish specialized articles. Social media like LinkedIn, Facebook, Google+ also offer the same ability, with the added benefit of reaching a larger audience. In summary, social media have a role to play in attracting and transforming new consumers and customers, and are crucial in converting strangers into content consumers. They offer a platform to cultivate the new legal consumers and to engage with them. Shama Kabani, The Zen of Social Media Marketing: An Easier Way to Build Credibility, Generate Buzz, and Increase Revenue, Benbella Books, 2013. In part 1 of this article, we learned that the new legal consumer is an online consumer who is informed, connected and picky. In part 2, we’ll first look at some statistics that will help us better understand the new legal consumers. Then we’ll have a look at how to accommodate them. The research done by avvo.com reveals new patterns of behaviour of online legal consumers, as the following statistics illustrate. 42% are doing their own legal research online. 31% are doing research on the lawyers whose services they consider using. 17% are using online legal forms to solve their problems. 16% visit legal forums to get assistance with their legal issues. How do they solve legal problems? The new legal consumers first try to solve their problems on their own. 42% solve the problem on their own. Interestingly, 20% of the interviewees thought they would end up knowing as much as a lawyer about their issue by doing online research. 32% get a free consult. 21% get free advice from a lawyer by phone or email. 15% call a legal help line. 33% end up hiring a lawyer. How are they finding lawyers? 31% find a lawyer by doing online research. 25% find a lawyer through referrals, but 45% of those will then still first research the lawyer online. 56% of legal consumers say they value a hotline that connects them directly to a lawyer. 76% of respondents also said they prefer fixed fee billing. So what can we learn from all this to help us accommodate the new legal consumers? In his report, Nika Kabiri advises to reach the consumers where they are and to give them what they’re looking for. Stephen Furnari (from Law Firm Suites, www.lawfirmsuites.com) suggests a three-pronged approach to achieve this. The key words are: cultivate / offer / engage. Cultivate online consumers: make sure you have a strong online presence. If allowed, publish online reviews by your customers, and/or use review sites. Offer assistance via email and chat, either online or on mobile. Offer what they are looking for: offer unbundled services, where they can ask your assistance, e.g., for one specific item. Offer fixed fee projects. Offer to review forms and documents. Offer strategy sessions. Engage with online consumers: offer on-demand services. Answer legal questions online. Participate in discussions on online forums and/or community chats that deal with legal matters. This three-pronged approach of cultivating and engaging with consumers, and adapting the services you offer, will help converting online consumers into customers. The Internet started a technological revolution, which in turn sparked a consumer revolution. You probably already have bought books, CDs or DVDs online. Or you may have opted for eBooks, mp3s and/or on demand streaming services for movies, TV shows and music. Many people buy their tickets for concerts and performances online. The same goes for plane tickets. Restaurants and hotels allow you to make online reservations, while fast-food chains even let you place your order online. Chances are your local supermarket offers the opportunity for you to order your groceries online, and then they’ll organize delivery for you. In short, we have become online consumers. As we have become online consumers, our purchasing behaviour has changed as well. How we buy online is different from how we used to buy. In the past, before the Internet, the traditional ‘path to purchase’ model was very straightforward, and involved 3 steps: awareness (of the product or service), consideration, and purchase. That linear model no longer applies. If I want to buy a product or service, I’ll do some research on it first. I’ll compare what’s on offer, and what the prices are. I’ll read reviews written by other consumers who have bought the product or used the service, and, if available, I’ll check out what rating other consumers give, etc. In other words, the process that leads to the actual purchase has become far more complex, and involves far more factors than before. This change in consumer behaviour also applies to the legal consumer. There are examples of people who have settled their divorces without employing any lawyers. People write their own wills and their prenuptial agreements, using forms and legal document generators they find online. Some have set up companies with limited liability, etc. And with all the information that is available on the Internet, people are more prone to first do their own research, before consulting a lawyer. Some months ago, Avvo.com published an interesting study on the new legal consumer: Nikka Kabiri, Sink or swim: How to adapt to the New Legal Consumer, 27 April 2016, avvo.com. (A free copy can be obtained at http://go.avvo.com/new-legal-consumer-download, but registration is required). In spite of this unmethodical and unsystematic approach to finding solutions for legal problems, Kabiri finds three major characteristics that can help us understand the behaviour of the new legal consumers (p.6 ff.). He describes them as informed, connected, and picky. There is plenty of legal information available online, and people are using it. They want to know more about their issue, and they are researching it online, by themselves, before even considering using the services of a lawyer. And they don’t shy away from the professional legal literature. The new legal consumers are reading legal articles; they value state codes as well as case law, where they look for precedents that provide information that may be relevant for their legal issue. Because of the Internet, we are witnessing the emergence of communities of legal consumers. The new legal consumers have access to other legal consumers online. They look for others who have had similar issues, and they read others’ experiences in online forums and communities. They also specifically look for online reviews of legal services that are being offered, and are more likely to use the services for which they can find reviews. The new legal consumers have access to diverse legal solutions online. They are using online forms and legal document generators. If given the choice, they prefer fixed-fee options. They also are attracted to unbundled services: they may, e.g., be filling out a form and get stuck on one or more items for which they need assistance. They will look for a lawyer online who can answer that question for them, and they’ll use his or her services for just that item. As the legal market is changing, legal service provides have to adapt. In part 2, we’ll have a closer look at certain tendencies in the behaviour of the new legal consumer, and at the ways to accommodate the new legal consumers.